Why you should use Greeting Card Creator? Greeting cards are the perfect way of sharing your affection and love with your near and dear ones. However, with changing times the definition of a card has changed tremendously. Now-a-days e-cards have become trendy. Therefore, there is a need of Greeting Card Studio – a card creation software. With this software, you can design fabulous cards for various occasions. This greeting card software is easy to use and both amateurs and professionals can take huge benefits from it. There are many reasons as to why you should use this free greeting card creator. Firstly is that the paper greeting cards are becoming expensive by the day and they are not environment friendly. If you use this software from Greeting Card Studio, you can create these cards at minimal costs and can still come up with wonderful nature friendly cards. Another reason to choose this card making software is that it offers various pre-designed greeting card templates for you to choose from. This will enable you to design a card within minutes without doing anything from scratch. With its easy to use intuitive card creating interface, you can design attractive cards with the least amount of effort. Besides creating a greeting card for various occasions, you can also design announcements, posters, invitations and other pieces of communication using this card creator software free. 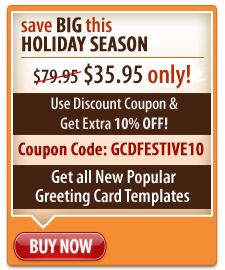 Apart from this, you can customize your card as required with varied functions of free greeting card studio software. During card creation, with the editing tools, you can edit the text and add text as per your liking. You can access a huge graphics library that has images, symbols, borders, backgrounds and shapes. This free greeting card creator also provides you liberty to insert your own photos to give a more personalized effect to your card. It offers a complete card creating tools with which you can crop certain features from your card, flip it or rotate it the way you like. You can also manipulate the brightness and contrast of your card and apply transparency effects to it. You can also publish your card in various formats such as PDF, JPG, GIF, BMP, PNG, TIFF and HTML. There is also a feature of convenient printing of cards with which you can print your cards easily at your home computer. You can also have your card folded half ways, quarter folded or accordion style in accordance with your requirement. If you do not want to print your greeting card, you can send it as email attachment and can save it for later editing and re-use.